Two years into her marriage actress Tichina Arnold tells us she's on cloud nine. Two years into her marriage to professional basketball coach Rico Hines, actress Tichina Arnold is still on cloud nine and loving it. She arrived on the “white” carpet at the ESSENCE Black Women In Hollywood brunch in Los Angeles today wearing the same shoes she walked down the aisle in and had nothing but amazing things to say about what married life has been like for her so far. 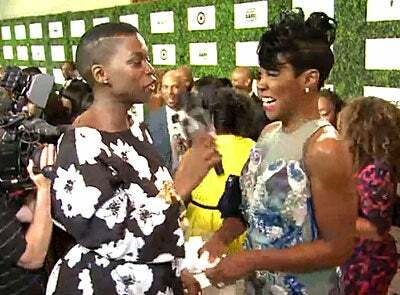 Actress Tichina Arnold (right) wore her wedding shoes on the red carpet at the ESSENCE Black Women In Hollywood event. The Scandal fan went on to tell us that she’d love to play herself on the hit show and hinted at loving the idea of a future cameo. Shonda, are you listening? The live stream of the 7th annual ESSENCE Black Women in Hollywood red-carpet aired Thursday at 2:30 p.m. EST. Catch a recap of the action here.